Chiwetel Ejiofor plays Mike Terry, a master of Brazilian Jiu-Jitsu who runs a self-defense-studio with his wife, Sondra (Alice Braga). He's pursued a samurai-like life, preserving his honor by avoiding a more lucrative life in prize-fighting. Faced with mounting debt, due to a series of events that began with an incident involving nervous lawyer, Laura (Emily Mortimer), and off-duty cop, Joe (Max Martini), Terry is lured into the ring. The strong cast has been forged from many different areas in the world of entertainment. Ejiofor's intense performance always keeps all eyes on him, despite the better-known actors that fill out the cast lineup. As movie star Chet Frank, Tim Allen is remarkably convincing playing an unusually serious part of an over-the-hill action star who still needs Terry to bail him out of a bar brawl. Former boxer Ray "Boom-Boom" Mancini manages to execute his role as a film stunt coordinator adequately, as well. And Mamet ensemble players Joe Mantegna and Ricky Jay are effective as a couple of duplicitous "good-cop, bad-cop" fight promoters corrupting the competition. Redbelt really gets its singular perspective on the world of mixed martial arts competition by melding two distinct but classic genres of film. Mamet frames the story in the traditional structure of the fight film (some of which he cites by name in a congenial Q&A included on the disc) such as Jules Dassin's Night and the City (1950), and Robert Wise's The Set-Up (1949). The elements of those films usually involve a retired or washed-up boxer being seduced back into the ring by the lure of money or redemption of some kind. They usually find themselves sinking into a morass of morally compromising corruption. Frequently they are asked to deliberately lose a fight in exchange for money. Our hero, Terry, is hesitant to sully the philosophy behind Jiu-Jitsu, that of defending oneself by any means necessary but only after exhausting all other options. He believes competition of any kind to be exploitative, and contrary to Jiu-Jitsu's underpinnings. But like in Akira Kurosawa's The Seven Samurai (1954),where seven principled fighters must defend a village against preying marauding samurai, he finds that he is alone among many other practitioners who don't mind selling their talents, and their souls, in pursuit of riches. By bringing in the genre elements of the samurai film, Mamet elevates what could easily have been a tired story into a unique one. Mamet then goes one step further, and brings a favorite theme of his into the film. Having explored the subject of con games with much more scrutiny in previous films, like House of Games (1987) and The Spanish Prisoner (1998), Mamet again introduces cinematic sleight-of-hand into the proceedings. Introducing an element of mystery to the game, in the form of three colored marbles that the competitors must choose from before the fight, the fight promoters assure themselves of a promotional gimmick that will not only raise box-office tallies, but give them more control of the outcome of each fight. Keep your eyes on the marbles, and see if you can figure out the con they use to guarantee who wins. Sony does its usual wonderful job with the DVD. I reviewed the movie on standard DVD, and the visuals are crisp and clean. This is a major achievement considering that Academy Award-winning cinematographer Robert Elswit (There Will Be Blood) generously uses red, a color that traditionally bleeds on home pictures. As for extra features? Redbelt is loaded with them. There is an interesting and conversational audio commentary with Mamet and former Ultimate Fighting Championship (UFC) five-time title-holder Randy Couture (who also appears in the film). Some of the other features include a behind-the-scenes featurette; a short on mixed martial arts; an interview with Dana White, president of the UFC; and profiles of some of the fighters appearing in the film. 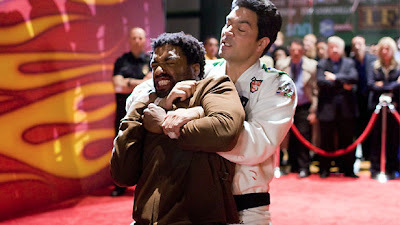 Redbelt is a smart thriller that should attract fans of mixed martial arts and lovers of quality films. Redbelt will be released on August 26th on both standard DVD and Blu-ray. Still provided courtesy of Sony Pictures Home Entertainment. This entry first appeared on Blogcritics on 8/7/2008.